Wishing to fritter away a pleasant evening seeing a stirring action film that evokes innocent boyish enthusiasms rather than brooding over the ongoing frittering of the curdled youth of adulthood? Indiana Jones and the Kingdom of the Crystal Skull is not the right movie for this, being all about middle age – which, for intrepid adventuring archeologists, happens sometime in their sixties. OK, it’s not all about that, it is also about the third big loopy archeological mcguffin, after previous movies tackled the Ark and the Grail. It’s obviously more self-indulgent than the earlier movies, and not just because special effects are much easier now than they were at the time of Raiders of the Lost Ark. And it’s sort of odd seeing Harrison Ford constantly alternating between being Indiana Jones and just an old guy dressed like him. Steve Jackson reports that Robert Lynn Asprin has died. Asprin was responsible for Myth Adventures (a humorous fantasy that I read in Phil Foglio’s wonderful comic adaptation) and Thieves’ World, the first shared-world anthology series – both of these were/are of great interest to roleplayers, I think. Via Rob MacDougall and the Wikipedia-blog Meine Kleine Fabrik, a Wikipedia article on Tanganyika Laughter Epidemic, apropos Laughter – first the Joker, then his signature weapon! However, Wikipedia also provides us with caped crusaders to fight the clown prince of crime. If Spring Heeled Jack was a bit too sinister, his Czech analog Pérák, the Spring Man of Prague apparently fought the Nazis! Dark chocolate can be dipped in Peanut Butter, I have just discovered. I am going to hell for this. This entry was posted in Blather, Comics, Science Fiction and Fantasy and tagged chocolate, fritteration, indiana jones, midlife crisis, sin, swanwick, wikipedia, yeats on May 24, 2008 by Dotan Dimet. Vincent Baker is the guy behind the roleplaying game Dogs in the Vineyard, but in an earlier incarnation of his website he had a great rant/howto about making pancakes which I always found fascinating. IMO it’s a much more effective stab at sarcastic cookery writing for a geek audience than Mark Pilgrim’s “sarcastic chef” posts (1, 2) – although I wonder if there’s some master of the form both of these writers are referencing, and which I am not aware of because he’s not a roleplaying/hacking blogger. Anyway, those pancakes. I made pancakes twice using Vincent’s recipe, and wasn’t too satisfied with my results. This saturday, with only eggs and flour in my fridge, I decided to try again, but perhaps read up on some other pancake recipes and howtos. And look it up on YouTube (this is my brother’s big cooking tip – find a video of someone doing it). Apparently, although Vincent makes a big deal about it, nobody else seems to separate their eggs, for example, although several sources make a big deal about sifting the flour. So I decided to play it by ear, although keeping close to the original recipe. 1.5 cups flour, sacket of vanilla sugar, sacket of baking powder, less than a teaspoon of salt, all mixed up. 2 eggs, some melted butter. Aarg! Will the hot butter fry my eggs? Oh no! Quick, pour some water in! Since I had no milk, I used cream (38% fat, the stuff you make whipped cream from). A whole carton of that. And some more water. And whipped the eggs and stuff vigorously, to make a lot of bubbles. Then mixed with the dry stuff, and added more water. There are two kinds of pancake batter, apparently – my mom used to make the thin sort, for crepes. Vincent’s recipe is definitely the other kind, all for thicker and smaller pancakes. Unfortunately, he makes a big deal about the batter, and my real problem is always the actual cooking part. What is this griddle he talks of? What are these Americanski units of heat? I only know frying pan, and the only setting I bother with is High. That’s what is needed for eggs, for example, or generally, to make food actually notice it is being cooked. Unfortunately, high flame and butter (you must use butter! a lot of butter! many sources suggest greasing the pan with butter between each batch of pancakes) means a lot of smoke. All the house filled with smoke. Perhaps, someday, I should give the medium flame a try. Except for the smoke though, it seemed to work. The only other problem is my ineptness in flipping pancakes in a crowded pan without flipping one onto another, or folding them, or generally making a mess. And there are those pancakes that go into the corner where the butter pools, and get a greasier, darker tint. But overall, the pancakes came out fluffy and yummy. Or maybe it was not eating all day that made them so good. 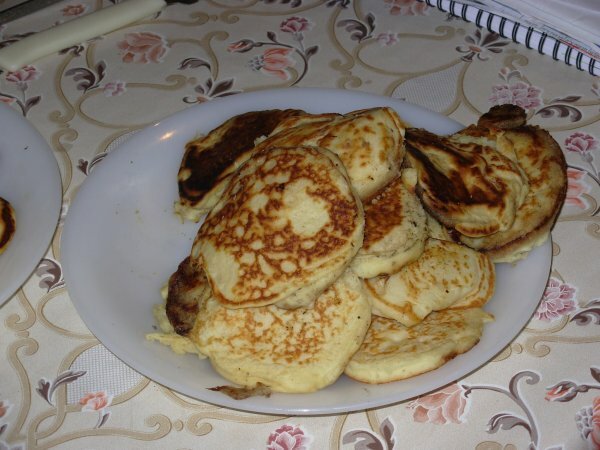 This entry was posted in Blather and tagged cooking, pancakes on May 19, 2008 by Dotan Dimet.